Have you spotted any of these lorries on the motorway? Our five new delivery vehicles are making heads turn right across the UK. 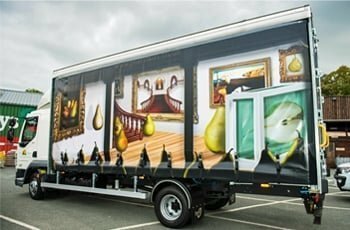 The surreal designs are the work of our talented team of artists, who have given a massive pear-shaped twist to a host of famous paintings. Vermeer’s The Girl with the Pear Earring, Magritte’s Son of Man and Damien Hirst’s A Pear Divided are just a few of the works that have been tweaked and blown up to eye-popping proportions. 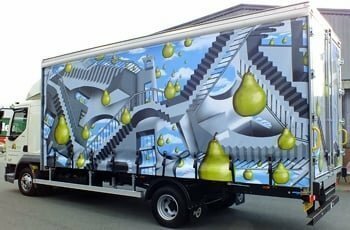 If you’re lucky you might also spot Salvador Dali’s famous melting clocks – or rather, pears – on one of the lorries. And you’ll never look at Munch’s The Scream in quite the same way again. The project has been led by creative artist Clare Harper, who studied at the world-renowned Central Saint Martins college in London. Inspired by M. C. Escher’s engraving Relativity with its never-ending, impossible staircase, she aimed to pique people’s curiosity by making the images both obvious and obscure at the same time. Although there are pears and stairs covering large parts of the canvases, any reference to the company name is subtly woven into the picture so you have to look for it. The unique designs are just like our beautifully crafted staircases and stair parts, in fact: original, high quality and with superb attention to detail. 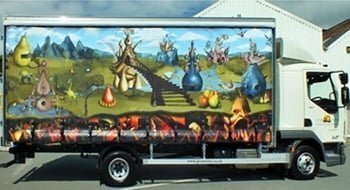 An entire lorry has been given over to a mind-bogglingly detailed tribute to the fantastical 15th century Dutch painter Heironymus Bosch. Based on his most famous triptych (three painted panels used to make an altarpiece), various pears are shown enjoying themselves in the Garden of Earthly Delights before getting their just desserts down below in an unflinching depiction of Hell. But not all Clare's designs are rooted in the work of old masters. 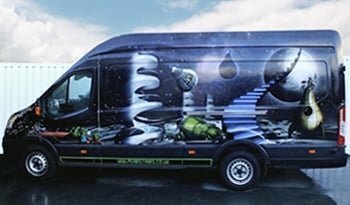 For the new Pear Stairs delivery van, she gazed beyond this galaxy and drew her inspiration from the Star Wars - or, rather, Stair Wars - film franchise. Our staircases are out of this world, after all. 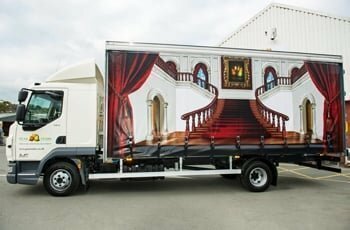 As a national company, we deliver direct to all parts of the country – so if you place an order, you too could find one of these mobile works of art outside your door. And if you spot one on the motorway, give the driver a wave! Clare's stunning creations haven't gone unnoticed in the design world - in fact, they led to her being shortlisted for a prestigious national award recently. Take a look at our blog to find out more.